That's not a bedroom, it's a torpedo tube. 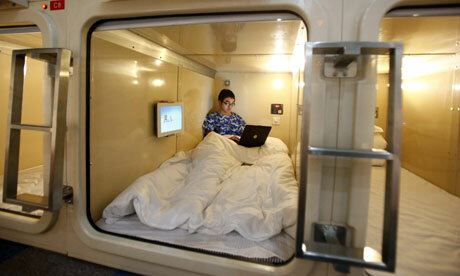 This actually appears to be a picture of a Japanese "capsule hotel," not a law firm's sleeping arrangements, but according to the article some firms do have sleeping areas that look like this. Others have rooms with single beds, rooms that presumably are also furnished with a chair and something to hang yourself from. Inevitably, the article quotes a couple of lawyers who make working around the clock sound like no big deal. "At times it's a slog," said one, "but there's also this tremendous sense of togetherness among those who share the experience." Maybe so, but then again the guy saying this is a partner, and so it's highly unlikely that he's sharing this particular experience these days. An alternative view can be found in this post, by a therapist who has written a series of posts for Above the Law, many of which seem to be about the effects of sleep deprivation on his lawyer clients. His view seems a little too harsh – at least at our firm, we don't actually try to "destroy" associates, crushing their spirit until they end up looking like "Gollum losing the One Ring." (Though I guess I have noticed some of them starting to slouch a little.) I'm sure there are partners who laugh in secret about the idea of "work-life balance," and the billable hour can be pretty soul-crushing, but on the whole we aren't Ringwraiths. Still, there is too much truth in what he says. At one time or another, we have all had to work longer hours than we would like, and sometimes there's just no way around it. But that has to be temporary, and you have to hang onto your actual life. At some point, the stress is just not worth it. I'm just saying that if you ever find yourself sleeping in a tube, you have probably reached that point.